Chemical earthing is engrossed copious superior & trustworthy as compare to conventional earthing, you may paragon deviating recompenses using chemical earthing technology. Ultimate of the earthing electrode patrons are now distressing away from prehistoricac customed conservative set up and desire maintenance free chemical earthing electrodes universal. Subsequent assessment discloses the much reparations of chemical earthing electrodes over conventional earthing grounding solution. Conservation Free: No need to dispense water at unvarying interlude excepting in grimy & filthy soil. Dependability: Preserve unchanging and dependable earth resistance. Supplementary Apparent Zone: The conductive compound creates a conductive zone, which delivers the augmentedsuperficial area for uttermost current dissipation. 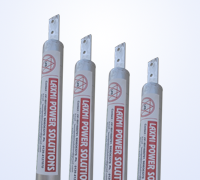 Laxmi Power Solutions are looking inquiries Delhi, East Delhi, South Delhi, Delhi NCR, Gurgaon, Lucknow, Kanpur, Varanasi, Jaipur, Jodhpur, Ajmer, Bawal, ballabhgarh, imt manesar, kotputli, sonepat, kundali, bahadurgarh, greater noida, gaziabad, yamunanagar, Panipat, ambala, jammu & Kashmir, indoor, Bhopal, Raipur, mohali, baddi, badmer, krishangarh, Kanpur, sikandrabad, Bikaner, Kota, Udaipur, Bhilwara, Alwar, Agra, Meerut, Aligarh, Allahabad, Banaras, Mathura, Jhansi, Ghaziabad, Noida, Bareilly, Moradabad, Saharanpur, Uttar Pradesh, Punjab, Chandigarh, Jalandhar, Amritsar, Ludhiana, Bathinda, Pathankot, Patiala, Hoshiarpur, Himachal Pradesh, HP, UP, MP, Shimla, Dharamshala, Uttrakhand, Dehradun, Haridwar, Roorkee, Rudrapur, Rishikesh, Nainital, Udham Singh Nagar, Gwalior and all over India. The precious property or possessions of Chemical Copper Earthing Electrode can be well protected with the help of a sound Lightning System. There are certain factors that are to be kept in mind in a good lightning system. Type of Earthing : Sealed maintenance free chemical filled earthing electrode. Model LPS 240 : ( Dia 40 x Length 2000)mm with CU conductor Size (30x4) mm. Modle LPS 250 : (Dia 50 x Length2000) mm with CU conductor size (32 x 6) mm. 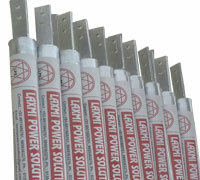 Model LPS 350 : (Dia 50 x Length 3000) mm with CU conductor size (32 x 6) mm. Modle LPS 265 : (Dia 65 x Length 2000) mm with CU conductor size (40 x 6) mm. Model LPS 365 : (Dia 65 x Length 3000) mm with CU conductor size (40 x 6) mm. Modle LPS 280 : (Dia 80 x Length 2000) mm with CU conductor size (40 x 6) mm. Model LPS 380 : (Dia 80 x Length 3000) mm with CU conductor size (40 x 6) mm. GBFC(Ground enrichment material) : Minimum25kg it is soil enrichmen chemical compound. Chemical GI Earthing Electrode provide a low-impedance ground in locations of high soil resistivity. Together with Reslow Grounding Minerals, the system dissipates lightning energy and other dangerous electrical fault currents, even in sandy or rocky soil conditions. Type of Earthing: Sealed maintenance free chemical filled earthing electrode. Model LPS 250 : (Dia 48 x Length 2000) mm with GI conductor size (32 x 6) mm. Model LPS 350 : (Dia 48 x Length 3000) mm with GI conductor size (32 x 6) mm. Model LPS 260 : (Dia 60 x Length 2000) mm with GI conductor size (40 x 6) mm. Model LPS 360 : (Dia 60 x Length 3000) mm with GI conductor size (40 x 6) mm. Model LPS 280 : (Dia 80 x Length 2000) mm with GI conductor size (50 x 6) mm. Model LPS 380 : (Dia 80 x Length 3000) mm with GI conductor size (50 x 6) mm. GBFC(Ground enrichment material): Minimum 45 kg it is soil enrichment chemical. Being a client-centric organization, we are homogeneously indulged in manufacturing, supplying and exporting a wide array of Chemical Earthing Electrodes. Our electrodes are designed using high-grade metal alloys and composition of several organic chemicals in adherence with international quality norms. Offered electrodes undergo stringent quality testing with our in-house testing facilities pertaining to company periodical. Available in varied designs, patterns and specifications; our electrodes are handy in protecting the human beings from callapsing in case of leakage current. 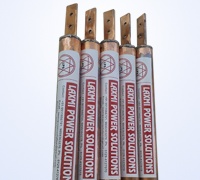 Laxmi Power Solutions is a leading supplier of Copper Bonded Earthing Rods. Our manufacturing process adheres to all parameters as prescribed by IS: 3043-1987 as well as UL. Copper Bonded Earthing Rods are sturdy, have longer shell life and efficient in dissipating fault current compared to plates or pipes. 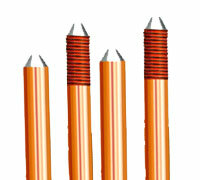 Copper Bonded Earthing Rods have the capabilities to be deep driven into the soil. This is helpful in difficult terrains and rocky terrains where the normal resistivity of the soil is high and it becomes difficult to achieve lower resistances. As per IS 3043: 1987, one can achieve lower resistivity at depths at greater depths. Often these levels are some meters below the surface. The most economical way of reaching them is by Deep Driven Earth Rod Electrodes. When deep driving is not possible mainly due to rocks, underneath, parallel driven shorter rods, plates, mates or buried conductors or a combination of three can be used. Earth rods are commonly made from solid copper or stainless steel with copper bonding. Copper Bonded Earthing Rods or Copper Bonded Grounding Rods are commonly used due to strength, corrosion resistance and comparatively low cost. This system includes rod along with accessories. Uncha Gaon, Ballabgarh 121004 Faridabad.